Doubles World No. 1 Bethanie Mattek-Sands, who suffered a traumatic injury in her Round 2 singles match against Romania’s Sorana Cirstea earlier this week, has taken to Facebook to thank fans for their support and to update them on her condition. What happened during the match? Mattek-Sands, top-ranked in the doubles, entered the singles competition as a wildcard and defeated Magda Linette in Round 1. But during her second round contest against Sorana Cirstea, Mattek-Sands, who had leveled the match at one set apiece, took a bad fall and was unable to get up; the magnitude of the fall became clear moments later, when the American ace began to scream in sheer agony. Calling for help from her rival and screaming in pain for a medic, Mattek-Sands – who at first glance appeared to have suffered an ACL tear – was taken off the court by ambulance and to hospital immediately. After a few days of silence, Mattek-Sands has opened up about the actual injury. Although the injury at first looked to be a serious ACL tear – not any less painful but a fairly common injury for athletes, it later became obvious the 32-year-old had dislocated her kneecap, which she has now confirmed. Unfortunately for the player, she has also ruptured her patellar tendon – the connective tissue that holds the kneecap in place to the shin bone. A rupture of the patellar tendon could mean a partial tear or a complete one, but it appears Mattek-Sands has suffered a partial rupture, making recovery easier than it would otherwise be. Injuries like this will require surgery, with the injured leg placed in a brace or cast to stabilize it. Mattek-Sands confirmed she will be heading into surgery in New York City tomorrow to have the injury worked on. Unfortunately, Cirstea lost her own third round match to former French Open champion Garbine Muguruza. The Romanian ace widely criticised Wimbledon organisers for how long it took medics to get onto the court. “It was heartbreaking because she went into shock. It took a while until the medical team was there – for a long time it was just me, her husband and my physio. “For me, I was there, it felt like so long. And I don’t know, there are sports where you see something’s happening, you see straightaway the help, like in football or boxing – it’s straight away. 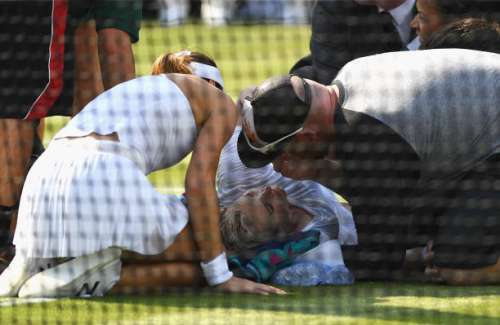 Mattek-Sands was administered morphine and oxygen at the time for pain and severe shock, while Cirstea and Mattek-Sands’ doubles partner Lucie Safarova were both in tears by the sidelines. The American ace, despite her injury, appeared to be in good spirits, and will go into surgery tomorrow.